“This is a challenge for me,” Manny Pacquiao said during media day at the Wild Card Gym in Los Angeles on Thursday, “because this is my first fight at the age of forty.” The 60-7-2 legend will be facing Cincinnati’s Adrien “The Problem” Broner (33-3-1) on January 19th at the MGM Grand in Las Vegas in a bout that will be aired live on Showtime pay per view. “I’m excited to be back in the United States to fight again,” said Pacquiao. “It’s been a while.” It’s also been a while since he had Freddie Roach in his corner. Pacquiao’s last fight, a destruction last year of Lucas Matthysse, was fought without the famed Wild Card Trainer playing his usual role of mastermind cornerman. This time, however, the two men are back together, along with Pacquiao’s right hand man, Buboy Fernandes. “We have no problems,” Pacquiao said of his relationship with Roach. 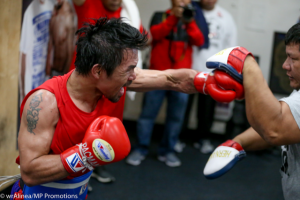 Pacquiao did, however, indicate he’s be interested in facing the winner of March’s Mikey Garcia-Errol Spence fight (he thinks Spence will win). He also, somewhat surprisingly, indicated he was eager to have faced the likes of Terence Crawford and Vasyl Lomachenko, his former Top Rank Stablemates. As far as his reputation go, the fighter/Filipino senator came across as quite secure. “My legacy is already there,” he said.